Tiger Woods' victory at Augusta capped one of the great sporting comebacks. We track how he rose from the depths of despair and four back operations, which saw him slump to 1,199 in the world, to become Masters champion once again. Woods' long climb back towards the top began with him playing the Hero World Challenge at Albany in December 2017 - his first competitive appearance since the Dubai Desert Classic 11 months earlier. He entered the week ranked a cavernous 1,199 in the world and, having undergone a fourth back operation in three years in April 2017, expectations were not high for the former world No 1, but he put in an encouraging display, mixing five birdies with two bogeys in a three-under 69. He followed that with a 68 only for a 75 on the Saturday to end his chances of a winning return, but a final-round 68 was enough to see him finish tied for ninth - 10 shots back from Rickie Fowler. And the then 41-year-old was hugely encouraged with his return at the venue where he had won his last major title - the 2008 PGA Championship. "I had the adrenaline going and overall I'm very pleased. I knew I was going to be able to play all four rounds, that wasn't going to be an issue," he said. "The issue was how was my scoring going to be, how was my feel, how am I going to get used to the adrenaline in my system for the first time in a while. I hit some really good shots out there and (it's) a bright future." Buoyed by his encouraging performance at the Hero, Woods made his return to full-field PGA Tour action at the Farmers Insurance Open in January 2018. He ended the week in a tie for 23rd place, seven behind winner Jason Day, following four consistent rounds of 72, 71, 70 and 72. It was his best finish in a full-field event since August 2015. His competitive desire was evident as he made it into the weekend thanks to a final-hole birdie in the second round, and his excellent short-game form briefly got him to within five of the lead during the final round, but the most significant result for Woods was that he again came through four rounds with no adverse effects in his fused back. "I'm very pleased," he said. "After not playing for a couple of years, to come out here on the Tour and really play a solid four days, I fought hard for these scores and I'm excited to get this one under my belt." After missing out on the WGC-Mexico Championship, the Valspar Championship at Palm Harbor was next for Woods, where he came so close to snatching his first comeback success. He started the final round at the Copperhead Course at Innisbrook Resort only one off the lead, and that's also where he finished as his final-round 70 saw him finish one shot behind Paul Casey following the Englishman's brilliant 65. Having struggled to make inroads during the final round, he set up a grandstand finish by draining a stunning 44-foot birdie on the penultimate hole, but was unable to replicate it at the last. Nevertheless, Woods' performance was his best on the PGA Tour since 2013. "It was a very good week," Woods said. "I've got a little bit better since the last time I played a couple of weeks ago. "It was a very difficult week - tough conditions on a tough golf course, very demanding and I thought I held up really well. It (being in contention) felt very comfortable." After a two-week break, Woods headed across the Atlantic to Carnoustie to play in The Open for the first time since 2015. After back-to-back rounds of 71, he was six off the lead at the halfway stage but a five-under 66 - his best round in the major for 12 years - took him to within four of the lead. Hopes of a fairytale win were raised when Woods suddenly held the outright lead midway through the final round with the leaders faltering, but a double-bogey at the 11th and a bogey at the 12th took him out of the running and he eventually finished in a tie for sixth on five under, three behind Francesco Molinari as the Italian claimed his maiden major win. Woods' one consolation was his breaking into the world's top 50 - securing him qualification for the WGC-Bridgestone Invitational, but he admitted it had been a missed opportunity. "I'm a little ticked off at myself for sure," said Woods, whose third-round 66 was his lowest score in The Open since he raised the Claret Jug for the third time at Hoylake in 2006. "At the beginning of the year, if they'd have said 'you're playing The Open Championship', I would have said I'd be very lucky to do that." After kicking off with scores of 66 and 68 at the WGC-Bridgestone at Firestone, a pair of error-strewn 73s over the weekend left Woods on level par and in a tie for 31st, 15 shots off the pace, prompting a vow to "clean up" his putting at the PGA Championship just a week later. And his homework almost paid dividends at Bellerive Country Club. After a bogey, double-bogey start, he dug deep to salvage a 70 and then posted back-to-back 66s to haul himself into contention. Roared on by huge crowds, he then fired a superb six-under 64 in the final round - the lowest final-day major score of his career. He finished in style too, rattling in a 20-footer for birdie on the final green to close on 14 under par, but it was not enough to secure him that elusive victory as Brooks Koepka held firm in front to triumph by two shots and win consecutive major titles. "At the beginning of the year, if you said I would have a legitimate chance to win the last two major championships... I didn't have a swing at the time, I had no speed and my short game wasn't quite there yet," said Woods. "My putting was okay, but I hadn't played in two years. So it's been a hell of a process for sure." Finally Woods had his win. Having admitted that he had exceeded his expectations in even qualifying for the season-ending tournament, he then held a share of the halfway lead with opening rounds of 65 and 68. Another high-quality 65 then took him three clear of Justin Rose and Rory McIlroy with 18 holes remaining. He stumbled on the back nine on Sunday with dropped shots on the 15th and 16th as the energy-sapping conditions took their toll, but a par save at 17th saw him take a two-shot lead down the last. And East Lake then witnessed incredible scenes as Woods parred the last for a 71 to secure his first title in five years by two shots and finally end his five-year winning drought with thousands scrambling for a good vantage point at the 72nd hole. "Some of the players I saw after on the 18th green knew what I was struggling with and it was really special to see them there," he said. "It's just hard to believe I've won the Tour Championship." History is made. Woods stormed to a blockbusting Masters victory on one of the most dramatic, and earliest, finishes in Augusta National history. With the Green Jacket looking destined to end up on the shoulders of Francesco Molinari with seven holes remaining, the Italian faltered down the stretch and found water at 12 and 15, while Woods vaulted into a two-shot lead with three birdies in four holes from the 13th. 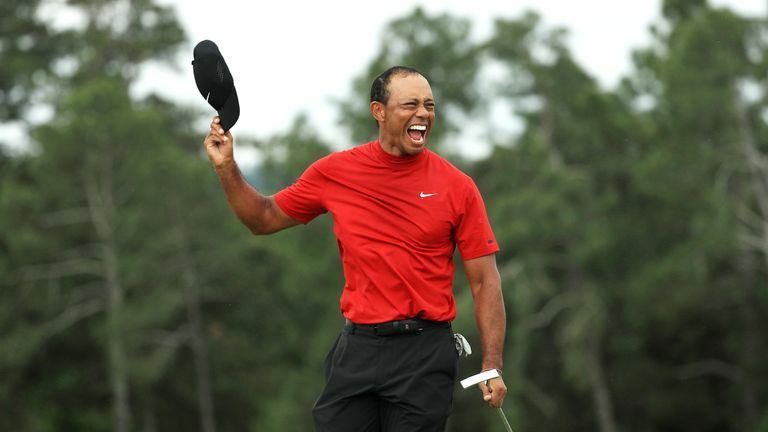 Paul McGinley reacts to Tiger Woods' remarkable Masters win, saying the nature of the American's comeback transcends the sport. And with challenges from the likes of Dustin Johnson, Xander Schauffele, and Brooks Koepka coming up just short towards the end of a remarkable back nine, Woods held it together and completed a two-under 70, a winning score of 13 under par which secured his fifth Masters title, his first in 14 years, and his first major since the 2008 US Open. "I didn't do it at Tampa, I didn't do it at The Open Championship, I was a little better at the PGA, but still I didn't win," he said. "So East Lake was a big step for me, confirming that I could still win out here and against the best players. VOTE: Who is the GOAT? "The Tour Championship is obviously the hottest 30 guys for the year, so to be able to do that against Rory and Rosey there gave me a lot of confidence going into this year. I said, 'you know, just keep building on it and let's try to get the mind and body peaking towards Augusta'.